Nothing lasts forever. Here we are then, at game number 101. The last in our (not really) definitive list of games that made our lives slightly better. What game do you pick to adequately round off this 3 year journey? How can you represent 100 entries, thousands of words and several podcasts? We’ve been through a lot on 101 Video Games That Made My Life Slightly Better. Doing this blog has been fun, has brought friends together and has given Lew and myself a great sense of achievement. At times it’s also been frustrating, has caused arguments, has been distinctly annoying and seemingly never-ending, and there have been long periods where nothing has really happened. Our final game was all those things for me, plus its name is perfect for the last post (natch). We have reached our Journey’s End. My best friend for most of my childhood was a guy called Tony. Between the ages of 9 and 16 we saw each other pretty much every day. We lived on the same road, walked to school together and were in the same class at school. During the school holidays we would hang out together along with my younger brother. When you’re 10 years old, school holidays seem to last forever and we were often bored and struggled to think of things to do. Things got pretty desperate at times; one holiday I’m pretty sure we went to Woolworths every single day just to look at the videos and toys, never buying anything. Those were the days eh? Tony had an old Spectrum (a hand me down from his older brother I think) and we used to dig that out and play on it, especially if it was pouring with rain outside. Even back then the Spectrum was pretty old fashioned, but we had no other options. I may be wrong but I think Tony didn’t own any two player games either. We were forced to play collectively, with one person controlling the game while the other two gave advice. This was surprisingly fun and kept us occupied for hours at a time. By far our favourite game to play this way was Journey’s End. 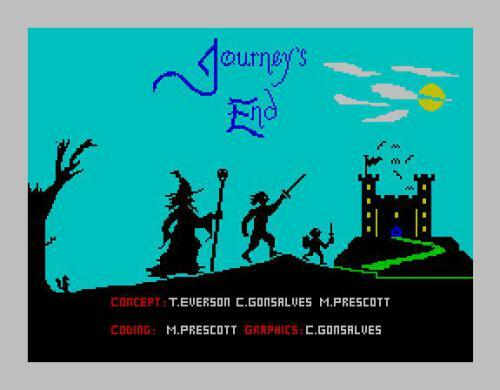 Journey’s End was a fantasy game, featuring the usual fantasy tropes – bands of warriors, spells, dragons, goblins (or was it orcs?) and so on. The game stood out by being split into four distinct parts which all played quite differently. It was also a long game. A very long game. So it was the perfect distraction to fill those long summer holidays. Everything about the game took time. To begin with, of course, you had to load the game. 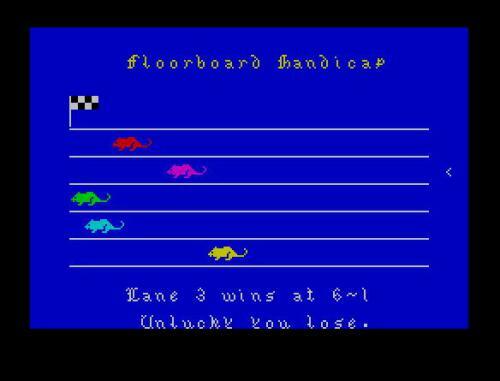 It’s an obvious point to make but it did take aaaaages to play a Spectrum game. I remember we would sit there waiting 20 to 30 minutes for a game to load. Or should I say try to load? Often games would crash half-way through loading so you would have to start again. I’m sure Journey’s End often did that. It was quite possible to spend 45 minutes just trying to start a game. Looking back it absolutely amazes me that two 10 year olds and a 7 year old had that level of patience. Here you can see all the gems, pots of gold and potions. But you can’t see the stupid invisible traps. The first part of Journey’s End was set in a maze. You would move around, exploring more of the maze until you found a key and a gate to escape. There were gold, gems and potions to find as well. Unfortunately there were also traps. Stupid, invisible, impossible-to-avoid traps. One of the most frustrating things about the maze was that you would only find the traps once you had set them off. The mazes were randomly generated and there was no logic behind where the traps were so it was sheer luck whether you ran into them. 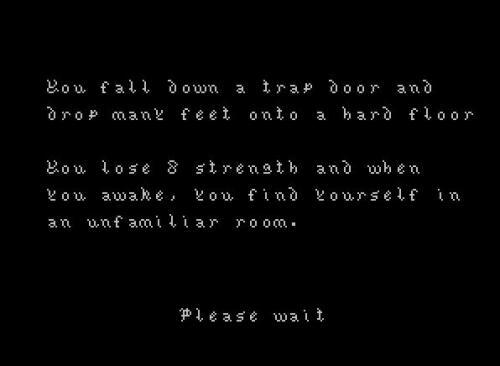 Not only that, occasionally you had strength points taken off because of a trap your character had fallen into during the bit between mazes, when you weren’t even controlling him. IT WAS INFURIATING. But we played it all the same. 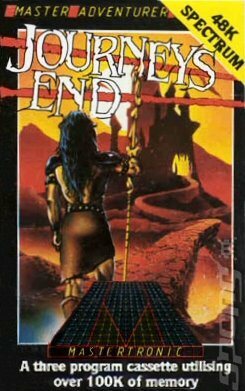 After a certain amount of mazes (again it seemed random the number you would have to tackle) you start the second part of Journey’s End: recruiting your band of warriors, wizards and warlocks (I know warlocks and wizards are kind of the same thing, I just wanted to use another ‘w’ word). Using the treasure you found in the mazes you recruit a group of men to come on the quest with you. Not enough gold? Well make some on the rat races! Just like my old Grandad used to say, always bet on the Green Rat. 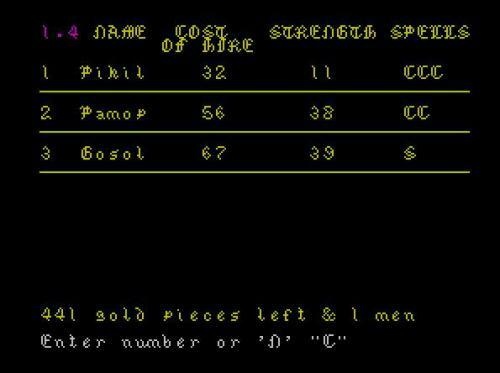 Being 10 year old boys we particularly enjoyed renaming the mercenaries so they had stupid and/or rude names. As a 31 year old man I suspect I would still find that funny. After advertising this is all I got. Rubbish! Once you’ve got your gang together it’s time to go to the enchanted castle where the ‘Elixir of Hagar’ is being guarded by a giant dragon. How exciting! Oh, first you’ve got to get there. 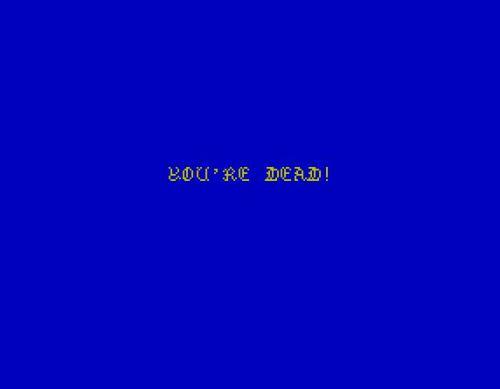 Yes the third part of the game was you making your way to the castle. It’s actually quite similar to walking around the map in Final Fantasy 7, with the same random annoying fights. It’s this stage of the game that I really remember. The image of Tony, my brother and I, sitting on a large cushion transfixed in front of the TV, using the cursor keys to sloooowly move our group up the map while being watched by Tony’s haughty cat Claude is burned onto my mind’s eye. That stage was hard and often we wouldn’t reach the castle. The battles would pick off your men one by one, it was easy to get lost, and of course there was always the danger that the game would crash. So here we go. Easy right. Nope. Looking back, this stage of the game does successfully recreate the feel of the first Lord of the Rings book, which emphasises just how far the Fellowship of the Ring actually have to travel. 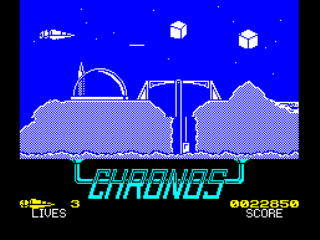 The problem is, while a book can use that time to concentrate on character, and while a film can distract you with flashy CGI and battles, a 1985 Spectrum game can only recreate the feeling of travelling nowhere fast. Again, the patience we had was incredible. Thrilling action from the map screen. If you did manage to survive the random battles, find the bridge to take you over the river and then find the castle itself, you could move on to the fourth and final part of the game – the Dragon’s Castle. Unfortunately I can’t tell you much about this stage as we rarely reached the castle. Even if we had got through the previous three stages without dying, by the time we got to the castle it was usually dinner time and my brother and I had to go home. The couple of times we did get there though it seemed impossibly hard. I think we reached the Dragon once, but by then our party’s strength had been massively depleted, and we had used all our spells so there was little we could do. Despite all of this we loved the game, and I think there was more to this adoration than just being able to call one of your warriors Arsebum. The very fact the pace of the game was so slow allowed Tony, my brother and myself to play it together. We gave our characters personalities, argued over the way to go, shouted at the TV in unified anger when we had tripped over an invisible bit of stone in the maze losing 5 strength points, laughed at each other’s jokes during the dull slog looking for the Bridge across the river and cheered when we found the castle. We may have never actually reached the End but the Journey was fun in itself. Saw this screen a lot. Speaking of endings, we’re at the end of this post and this blog. Well, we do have two more podcasts to come about games that didn’t quite make the magic 101, but our list of games is now complete. For those who have read/listened to all 101 posts I hope you enjoyed them and Lew and I would like to think that the blog has made your lives (very, very, very slightly) better. Or at the very least not worse. Every ending is a new beginning though and our new project will be launched sometime in the summer. Hope you can join us on that journey too. One last thing before I go: fancy playing Journey’s End? 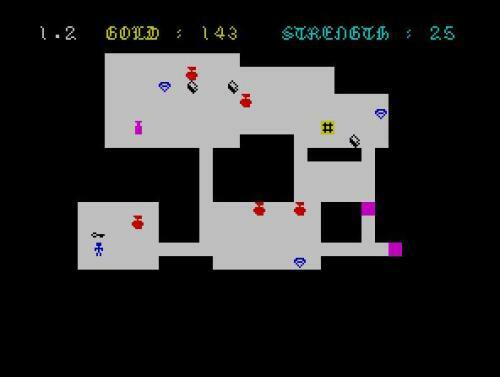 Then go here for this excellent repository of old Spectrum games. Isn’t the internet marvellous?